Have you tried yoga? This ancient practice from India isn’t only for young, limber health nuts. In fact, people of all ages, shapes and abilities can do yoga, with adjustments tailored to each individual. Yoga is a 5,000-year-old mind-and-body practice rooted in Hindu philosophy. The name comes from the Sanskrit word meaning to yoke, bind or unite. Today, numerous types of yoga exist. The common thread is that practitioners engage in poses or postures (asanas), combined with mindful breathing, to develop their physical and mental well-being. Yoga is not a religion, but it often has a meditative, spiritual or philosophical quality that many people find appealing, rewarding or rejuvenating. Others take part in yoga mainly for the physical benefits. What you get out of your yoga practice is up to you! It’s common for older adults to gain weight and and lose muscle strength over time. Yoga can help you take action against these changes and maintain as much health and vitality as possible. Many people who practice yoga regularly experience improvements in strength and balance/stability, which helps prevent falls. They may also see positive changes in their flexibility, stamina, joint health and range of motion, respiratory function or chronic pain. One study found that yoga reduces oxidative stress, which contributes to high blood pressure. Regular yoga practice can also ease sleeplessness, stress, digestive problems, depression and anxiety, as well as improve self-confidence, body awareness and mindfulness. 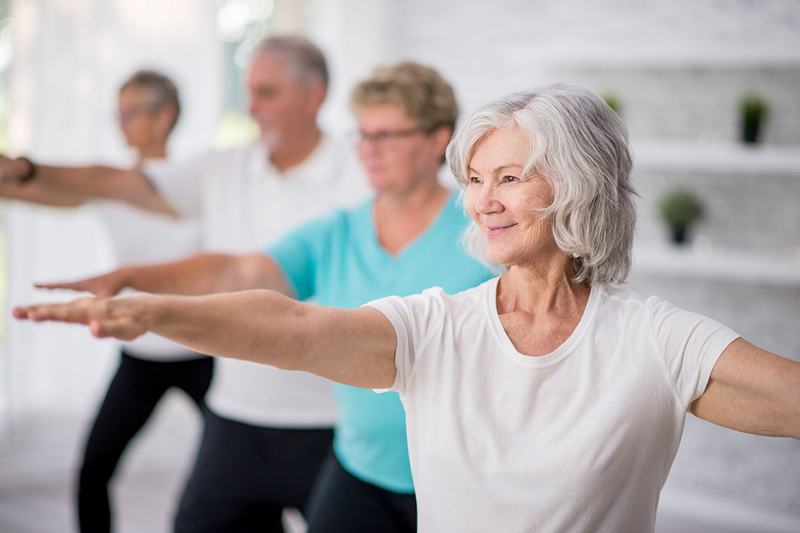 Yoga may also be helpful for people who have a chronic condition, such as diabetes, or who are recovering from injury or illness, such as a stroke or cancer. Ask your physician or physiotherapist if yoga is right for you. Before you try yoga, it helps to understand the different types. The ones described below are often available at yoga studios, community centres and gyms. Before you sign up, ask questions to find out what the class will be like, and whether it’s suitable for beginners. Remember to consult your physician before starting any new exercise program. Hatha yoga: This is a good place to start your yoga journey. The term “hatha” encompasses any yoga that involves physical poses (including other types described below). When it’s used to describe a yoga class, it means you can expect a slow or moderately paced class with many different poses, each held for a few minutes. Ashtanga yoga: This is a vigorous, fast-moving type of yoga that links a predetermined sequence of poses with your breathing. Ashtanga, also known as “power yoga,” is challenging – if you’re a beginner, it’s best to start with a gentler, slower-paced class. Iyengar yoga: Named for the yogi who developed it, Iyengar yoga is an adaptable type of yoga that can be modified for people with different abilities and needs (such as people with a chronic illness, injury or disability). Iyengar emphasizes precise alignment, in order to encourage weaker muscles to get stronger and tighter areas to relax. Vinyasa yoga: Also known as “flow” or “vinyasa flow,” this type encourages seamless movement between poses, synchronized with the breath. The sequence of poses changes from class to class. Often, instructors play music during class. Restorative yoga: True to its name, restorative yoga promotes rest and relaxation. A typical class might involve five or six poses, held for several minutes each, and supported by props such as blankets, blocks and bolsters (cushions) as needed. Chair yoga: People with balance issues or limited mobility can try certain poses while sitting in a chair. See “Additional resources,” below, for links to videos that demonstrate these and other chair poses. It’s best to learn yoga by taking a class, with the guidance of a certified yoga instructor. This is especially important if you have physical challenges. Your instructor will ensure that you’re doing the poses safely and correctly. You can take a break or ask for assistance anytime you need it. Look for classes described as introductory, beginner or for seniors. Start slowly and gently, and be patient with yourself – it will take time for your body to feel comfortable in unfamiliar poses. Enjoy the process of learning something new, and don’t be afraid to ask questions.